I don’t know about you, but I’ve been a bit bored with the lack of images here, so I have signed up for a flickr account in order to minimise the hassles of uploading. 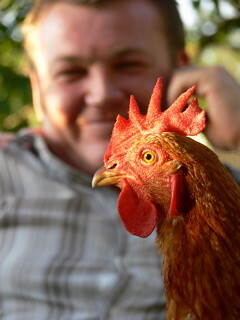 This should be a picture of my friend Tony with his pet chicken, Number Seven. Author laranettlePosted on February 25, 2006 Categories The Life of LaraLeave a comment on This is a test…. And 1/2 a kilo gone ! Mark and I joined Weight Watchers last monday night, and at our weigh in last night we had each lost 500 grams. Mark didn’t think that was such a huge loss for so much effort, but I am really happy – that’s a whole tub of marg I am not toting around with me every day, and I know I can put more effort in and get good results. I am not in a hurry to reach my goal weight, this time I am happy to focus on changing my habits, and becomming a fitter, healthier, more organised, and happier person. Yay for me ! And yay for Mark. Author laranettlePosted on February 21, 2006 Categories The Life of LaraLeave a comment on One Week Down…. Silk is a fibre made by larvae to protect them while they metamorphose into their adult form. It is very fine, soft, and strong, and when collected and made into clothing etc, is light and soft against the skin, yet very durable. But it requires the death of thousands of creatures. The cocoons are “stifled” (they don’t call it killing), before the silk can be harvested. I don’t have any scientific knowledge of whether they feel pain or not, but to me that is beside the point. To kill another creature to save my own life is one thing, to kill for comfort and luxury is quite another. Since I know that angora bunnies are farmed for their coats, and I know that bunnies are intelligent and sensitive creatures, I also won’t buy or knit with angora. And NZ possum? Four Australian possums were taken to NZ many years ago, and now they have reached plague proportions. Many people have no problem using the fur from their pelts to knit with, knowing that the animal was killed to get it. I’m just not comfortable with that.